WASHINGTON — The Museum of the Bible’s newest exhibit, The Slave Bible: Let the Story Be Told, will be on display through April 2019. It spotlights a rare artifact — an abridged version of the Bible that was used by British missionaries who worked with enslaved Africans in the Caribbean. The exhibition provides insight into a dark moment in history in which the Bible and religion were used for imperial and economic gain. An abridged version of the Bible, which became known as the Slave Bible, was published in London in 1807 and used by some British missionaries to convert and educate enslaved Africans about Christianity — while instilling obedience and preserving their system of slavery throughout their colonies. 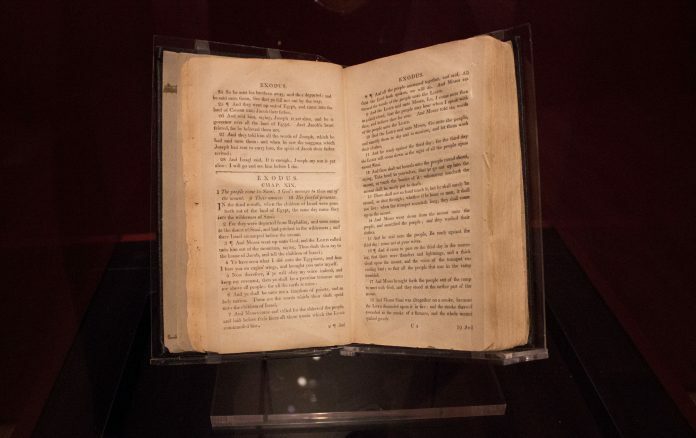 British colonists created the Slave Bible by removing sections — and in some cases entire books — from the Bible out of fear that the full Bible would promote rebellion among slaves or offer hope for a better life. The story of the Exodus from Egypt and the book of Revelation were stripped from this truncated version of the bible. The results were drastic. A typical Protestant edition of the Bible contains 66 books, a Roman Catholic version has 73 books and an Eastern Orthodox translation contains 78 books. By comparison, the astoundingly reduced Slave Bible contains only parts of 14 books. “The Slave Bible was used to push a specific message to enslaved people. But this important artifact raises questions about much more than just this moment in history of human enslavement and Christian missions; it raises questions about how we understand and use the Bible today,” said Seth Pollinger, Ph.D., director of museum curatorial. For African Americans, the book of Exodus is a cultural touchstone and continues to be exceedingly influential. The story of the suffering of Israelites as Egyptian slaves and their deliverance spur comparisons of the capture of Africans, the experiences of African Americans in the United States and their hope for a better tomorrow through emancipation and civil rights legislation. The exhibit is presented in coordination with Museum of the Bible partners Fisk University, and the Center for the Study of African American Religious Life at the Museum of African American History and Culture. Throughout the coming months, Museum of the Bible will hold a series of cultural events and panel discussions with clergy, historians, educators and thought leaders to highlight the artifact and its impact on religion today. The Museum of the Bible is at 400 Fourth St. SW, Washington. You can learn more at 866-430-6682 or at museumofthebible.org. Admission is $24.99 for adults; $14.99 for children 7-17; free for children 6 and under. Seniors, military, first responders and students receive admission for $19.99 and tickets purchased online will be offered at a discounted rate of $19.99 for adults (18+) and $9.99 for children (7-17).